Whether you want to enjoy a leisure afternoon practicing the game of kings, or challenge yourself with unknown territory, Costa Rica offers great opportunities for golf vacations. With world class golf courses set in incredible locations, Costa Rica is an absolute must for anyone looking to practice their swing. In addition, Costa Rica is the perfect destination for vacationers with wide interests. With so many activities to do and places to see in this idyllic location, it’s easy to find something that helps you unwind as well as something that keeps you up on your toes. When it comes to golf it’s no different. Many golfers find their peace amid the wondrous nature of Costa Rica, but others can see how it adds a competitive edge, as it is unknown territory to them. That’s where Costa Rica golf vacations comes in. Since several hotels have easy access to the best golf courses in the country, we can tailor the most incredible golf vacation for you and your friends. Costa Rican Vacations is happy to help put together your dream golf vacation. We provide expert insight on where to stay and how to take advantage of different locations. Simply tell us what you want to do, and we can tell you where to go. Although most hotels don’t include access to golf courses in their regular fees, you have easy access to them. Some are even in the same grounds as the resorts, which means you can enjoy the fields and hotel amenities without traveling far. The sport itself provides a variety of benefits for your mental and physical health, and we understand scenery is a crucial element of this process. Costa Rica has plenty to offer, with a large variety of climates and wildlife. The Pacific ocean, lush tropical forests, and open blue skies can all be part of your stay. Swing away your worries as you immerse yourself into the game and the natural wonders around you. Don’t forget to look up and spot the birds that fly by. In addition, all properties with access to golf courses offer great accommodation and top notch service. However, they also offer different vacation styles. There are luxury villas, all inclusive resorts, and even specialized boutique hotels. If you are traveling with your family, a group of friends or by yourself, don’t worry. There is something for everyone. If you are not sure which one is the best for you, contact us and we will be happy to help. Our packages can be adjusted to your needs and wants. Other activities besides golf, like adventure tours, can also be part of your stay. As an example, travelers who don’t want to worry about a thing will love the ‘Costa Rica Luxury All Inclusive’ vacation package. This brings you to some of the country’s best hotels in the Guanacaste region of Costa Rica, which is close to many of the most spectacular beaches and experiences in the entire country. In between action tours that will get your adrenaline pumping, you can spend hours perfecting your swing on some championship-level golf courses. Many of these are also part of a luxury hotel, ensuring a memorable day on the links and a wonderful experience at the resort. Another way to ensure you have an amazing golf vacation in the country is to know what to expect. Costa Rica is located in the tropics, and as such it has different a different weather and vegetation from the United States and Europe. The heat can become overwhelming for some visitors, and since golf takes place outside, we can’t stress enough that you must keep hydrated during the game. For that same reason, your pace might be slower. If a par-72 golf course can take 2-3 hours, here it could take 4 or even 5 hours. It’s a matter of saving energy and not forcing yourself. After all, Costa Rica’s Pura Vida lifestyle means kicking back and enjoying the moment. Simply enjoy the ride. Similarly, we recommend you avoid playing between 10:00 am and 2:00 pm, when the sun is stronger. Even professionals often play from 7:00-11:00 am, go to the shade, and then return to the game from 2:00-5:00 pm. Remember that whatever hours you choose to play, always put on sunblock. If the opposite happens and it starts to rain, it’s always better to get off the open field. In Costa Rica rain (anything from light showers to thunderstorms) can occur at almost any moment, although some weather is more likely to happen in certain seasons. Make sure to ask one of our agents about the best seasons to come golfing. And if it starts to pour, relax. Lounge at the hotel and have some fun. Hotels will let you return to finish the game once it stops. Some of these properties are very big, and to move things along a golf cart is of great help. In addition, a golf cart usually includes a towel and water bottle to help you along. Grab some discounts by playing after 1:00 pm. Most hotels offer similar options. Ask us in case you have any questions. 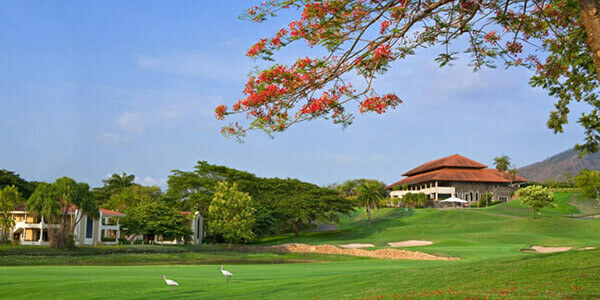 Some of Costa Rica’s best golf courses are in the Guanacaste area, towards the north of the country. Expertly designed and neatly maintained, these golf courses guarantee top notch entertainment. If you’re an avid golfer, you’ll want to take a look at Los Sueños Marriott Ocean & Golf Resort—and the accommodation you’d get to enjoy as part of the customizable Los Sueños Vacation packages, where you can combine golf with some sportfishing. In between boat trips out on the Pacific, you can spend time relaxing at your luxurious private condo or enjoying the pool, casino, spa and multiple restaurants that also make up the resort. And then, of course enjoy golfing at La Iguana Costa Rica Golf Course. This 18-hole, par-71 course brings you close to many of the most beautiful parts of the tropical environment, including rain forests and the sparkling Pacific Ocean. The Ted Robinson-designed course is so close to nature that you may even spot some native wildlife like monkeys or macaws as you’re teeing off, making for a memorable experience. Another example of great golf & fishing combo vacation packages is ‘Fishing in Paradise’, that offers the opportunity to enjoy five-star resorts like the Westin Golf Resort & Spa. Set on the northern Pacific Coast, this all-inclusive resort offers more than just ocean-side adventures. Although spending your days diving, swimming or off-shore fishing will certainly be in the cards, there are also opportunities for golfing at this Costa Rican resort. Its Reserva Conchal Golf Course features 18 holes with a par of 71. Designed by Robert Trent Jones II, the course puts an emphasis on the surrounding landscape, ensuring that all golfers will get to enjoy the natural beauty of the area during their adventures. With ocean views and high-quality greens, this course offers everything a golfer would want in their links. After a day out on the fairway, you can spend your time on the tennis courts or in the free-form swimming pool at the resort, while options like the on-site spa and restaurants provide a place for you to relax and refuel after a long day. The best golf courses in Costa Rica are located on the Pacific coast. Even though they extend across shaded and sunny areas, prepare for Costa Rica’s heat with a good-sized bottle of water.